I always hated the “which came first?” question. As a card-carrying elementary school legalist, I suspected that question was an underhanded attempt by liberal left-leaning communist God-haters to take our eyes off the biblical account of creation. Of COURSE God created the chicken and not the egg. Had he created the egg, that would have given credence to the Easter Bunny, and we all know the downward spiral that would create. 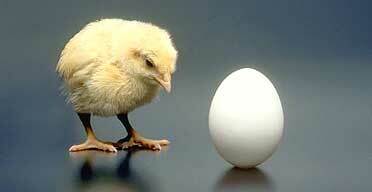 Yesterday Spence Shelton and I had a version of the chicken or the egg discussion. It was a great reminder to me that even in a church our size, our pastors are still working out of the same playbook and operating under the same DNA. Spence and I had an opportunity to have lunch with a guy who is building the small group ministry at a church plant in Mebane. His question: at the Summit, do you encourage people to get involved in the church or in a small group first? The answer? Well, it’s a chicken or the egg. We decided a while back that we couldn’t be too choosy in how people get connected to the Summit. People tend to connect in areas that offer (a) the path of least resistance, (b) the faces or relationships that are already familiar or established, or (c) the best snacks. For example, if you are new to the Summit but your co-worker is a small group group leader, you’re probably more likely to connect via the group and then…someday down the road when it’s convenient…connect to the church via Starting Point. On the flip side, if you’re new and don’t know anybody but smell pot roast after the 10:45 service…you can kiss your small group connection goodbye because doggone it, you’re going to the Starting Point Luncheon. Starting Point (our avenue for connecting to the church) describes the DNA of the Summit. Small groups live out that DNA. If you don’t like the former, there’s no sense in you wasting your time in the latter. Small group leaders are trained in and passionate about building disciples and fostering community. If someone uses their group as the litmus test to see if they like the church, turnover rate becomes very high and frustrates the leader, the existing group members, and the guy who’s just scoping out the group. Starting Point gives context to the why of church. Small groups give tools to the how. And perhaps the most important, Starting Point has beautiful up-front people whose sheer attractiveness can never be replicated by the leaders of most groups. If you’re a pastor or even an opinionated church member, you could probably argue from the opposing perspective and it wouldn’t make me mad. As I said, it’s a chicken and egg argument, but the preference of the two guys most responsible for connecting people at the Summit is that it’s Starting Point first, small group / GroupLink second. That said, if you’ve been through Starting Point and have yet to connect to a group, your next opportunity comes this Sunday morning. GroupLink happens all morning long in the Brier Creek lobby. Still need to do Starting Point? We kick off a new year on January 4th.